Based on a long collaboration and several projects in Europe and in Meddle East, a new partnership was elaborated at the occasion of the Hight Level Meeting on Development and Disability with the new 6th DPI Region, the DPI Arab Region. When the peoples of the Arab countries undertake with courage in the developing of societies more respectful of Human Rights, people with disabilities are putting their experiences in the service of peoples of good will. For peace, for protection of people with disabilities in war zones and for their participation to the democratic development, the DPI members unite their efforts. Following the decision of the World Council of DPI in Seoul in September 2007, which engages DPI to establish a new 6th world region of the countries that share the common Arabic language, i.e. the DPI Arab Region -, and which nominates Dr Nawaf Kabbara to take all adapted initiatives to achieve this creation. 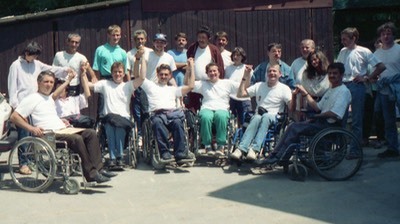 3: Develop specific cooperation and initiate programs for the training of experts with disabilities.